We offer several opportunities for Coaching that can make your life easier, more enriching, and more spiritually enlightened. Coaching is available for individuals, plus we have a few special opportunities specially designed for Spiritual Leaders, Ministers, and Teachers. Special One-on-One Coaching offers a private and confidential spiritual partnership with Rev. Bil and/or Rev. Cher that focuses on your spiritual growth and enrichment. Our special coaching package is unique because it is customized for your specific needs, and provides a 6-month timeframe to help you see consistent, progressive, meaningful growth. Typically, people who employ our Spiritual Coaching On-Demand™ are people who consider themselves more spiritual than religious. They are people who are curious, and want to make the best possible choices in their lives. They are results-oriented and pragmatic, interested in the dance between science and spirituality. Good candidates for Coaching On-Demand™ are those who welcome feedback, using it as a sounding board to confirm or challenge their thinking. Good Coaching On-Demand™ candidates see it as the perfect Obi-Wan Kenobi-type strategy to improve their choice management, self-development, and spiritual enrichment — rapidly and objectively. Rev. Bil and Rev. Cher enjoy working with individuals by telephone, Skype, e-mail, or in person. Their unique coaching strategies are customized for each individual, and offer a variety of options to fit any budget, work schedule, and time frame. Check out our Special Coaching Package now. Concierge Coaching™: Personal spiritual guidance and enrichment … your style your schedule, your needs, your way! Our spiritual concierge service delivers content-rich spiritual education to you online 24-7-365. Our cutting edge spiritual practice concierge services offer you a wide bandwidth of high caliber spiritual teachings that will answer many of your unanswered questions, but will also inspire you to question unquestioned answers! Learn more about this unique and powerful coaching service. Presentation Coaching for Ministers, Spiritual Leaders, and Teachers: As a minister, spiritual leader, or teacher, your credibility is critical. Nothing affects your credibility and professional image as much as your ability to present. Every time you are in front of a group, whether it is in a small team meeting, your congregation, a group of potential members, or potential investors, you have the privilege of inspiring, educating, and guiding the decisions of those listening to you. This confidential coaching is customized to address your specific needs as a presenter, and is designed to give you special one-on-one guidance in enhancing the quality and comfort level of your presentation skills. Learn more about this unique and powerful presentation coaching. We can be your Blog Mentor: Blogs are one of the most under-used tools we have for creating a powerful online presence. 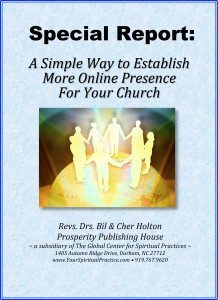 We can help you either create or transform your Blog into a tool that will drive people to your church or spiritual center, increase donations, and spread your message like wildfire! You are already overloaded with things to do, so let us make your life easy! We can ghostwrite blogs that reflect the topics you request, and even include legal artwork to give it greater presence. We can also serve as your blog mentor, guiding you in the process of getting your blog the exposure and power it needs to be worth its weight in gold! Your financial investment can begin as low as $50, and varies depending on the parameters of how you want us to help you. Email or call us (919.767.9620) to talk about your goals and get a price quote! We will work to fit your budget!